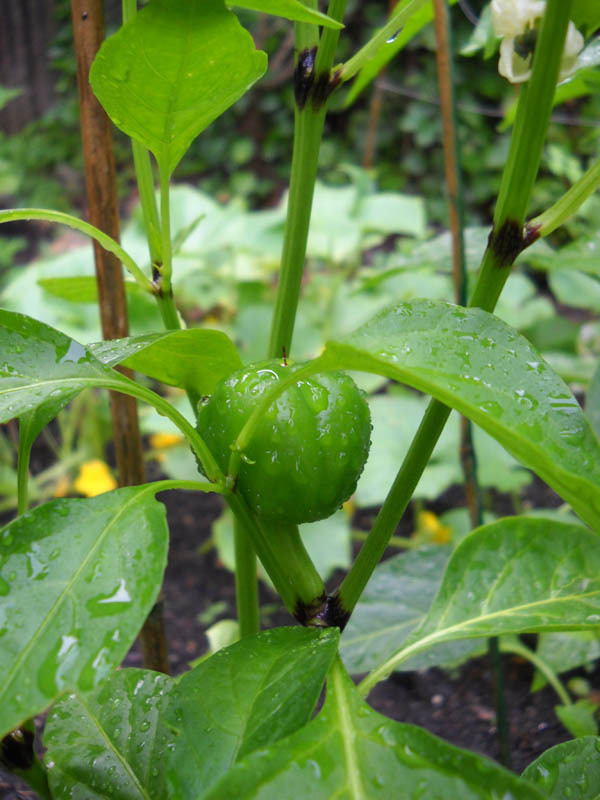 Inside Storey: Garden Update: Is There Something Wrong, or Is My Garden Just Behind? Garden Update: Is There Something Wrong, or Is My Garden Just Behind? 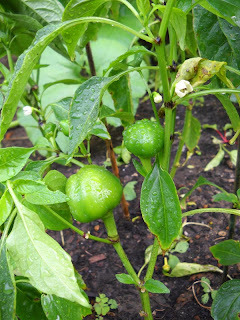 This year I expanded my garden by two rows to grow more vegetables, but only a few plants are producing. I am wondering if my garden is running late this year or if something is wrong with my plants. Here's a rundown of what's going on in my garden midseason. Tomatoes — I started all but one tomato plant from seed, and I have about four varieties. The plant I bought was a cherry tomato plant, and I have picked a few ripe ones so far. All the other plants are flowering or have green tomatoes by now. Peppers — Some peppers I started from seed, but most I purchased. The purchased plants were bell peppers and hot cherry peppers. All of the plants I purchased are producing peppers or flowering. Only some of the plants I started from seed have flowers. The bell peppers are doing well. Right now there are about four peppers. I have six plants, so I am expecting many more. Peas — The peas were doing well. I had been harvesting them and adding to my salads. But before I was able to harvest a good bounty, a garden trespasser ate them from the bottom of the shoots! No more peas for me. Romaine Lettuce — I used several not-quite-mature heads in my salads. Those that I left to mature bolted. I have started more from seed — they are about 2 inches high presently. I planted these in a partially shaded area, and I am hoping for the best with batch two. Chives — Can you really mess up chives? They come back every year. I use them from early spring through late fall in my salads, casseroles, potatoes, and so forth. I also cut the chive flowers while in full bloom and packed them in jars with white vinegar for a vinegar with a spicy kick! Garlic — So far, so good, I think. I planted two (sort of three) varieties this year. Aja Rojo, German Hardy, and the German Hardy from my last year's harvest. The Aja Rojo did not grow very tall, and by about a week ago, all the leaves had turned brown. Because of this I harvested those. They are very small and are currently curing in the sun. Other than being tiny, there doesn't seem to be anything wrong with them. 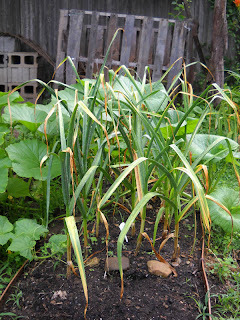 The German Hardy garlic should be ready for picking in a week or two. The stalks are more than two times the height of the Aja Rojos. I also cut all the scapes about a month ago and used them in pesto, mixed them in with grilled vegetables, added some to a jar of olive oil, and used the rest in a stir-fry — YUM! cutting through the garlic patch. Potatoes — These look good so far, too. They are tall and leafy, and some of them produced flowers. Some also produced green bulbs (I am unsure what those are). I won't know until later in the season how they did, but based on outer appearance, they look plentiful. Kale — Doing well. I've used some, but I now realize that I don't eat much kale. I don't think I will grow again next year. Herbs — Are all doing well. I use my fresh herbs almost every time I cook. All of them, with the exception of the sage bush in my garden, are in pots on the deck: basil, dill, mint, cilantro (this one is beginning to go to seed), oregano, flat parsley, curly parsley, and rosemary. 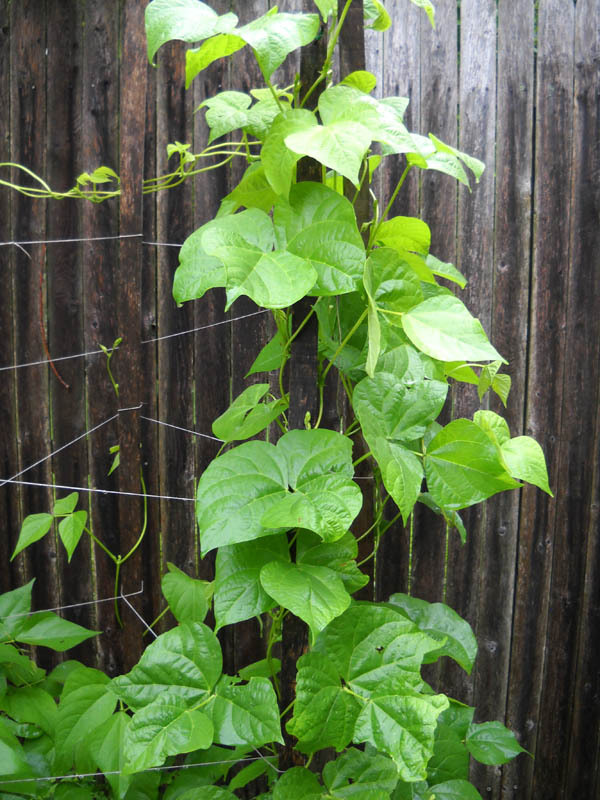 Green Beans — I planted two varieties. Some have grown quite tall but are not flowering. The other, a French type, is short but has begun flowering. No beans yet — I planted them a little on the late side (mid-June) directly into the garden. I am hoping these will produce well — green beans are one of my favorite veggies. but where are the blossoms?! 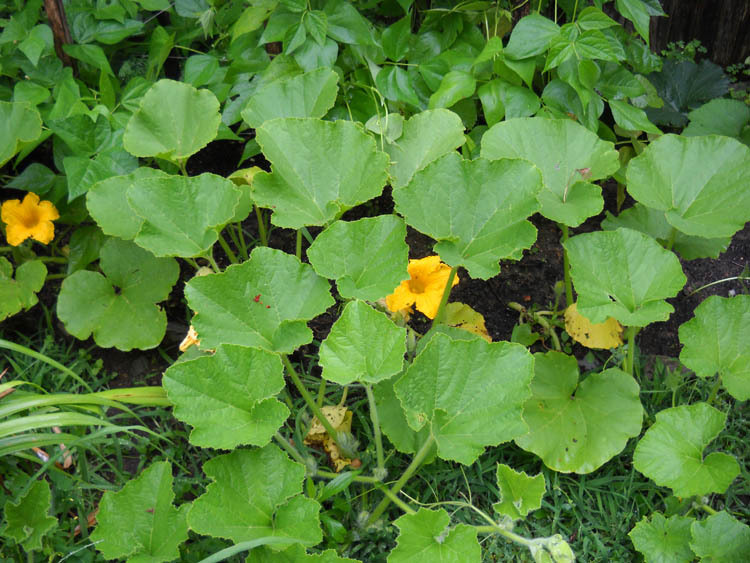 Zucchini and Summer Squash — Some have just begun to flower; others have no flowers at all. None of them has signs of a squash. I never have had a problem with these in the past. Actually, the opposite is true — I usually have too many. Perhaps, if I am patient, the plants will come through for me. of the actual squash. What is going on? Boston Marrow Squash — These have big leaves and blossoms but no signs of squash. All I can do is wait and see. 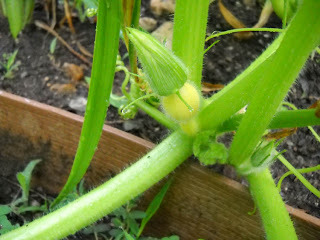 to be doing well — no squash yet, though. 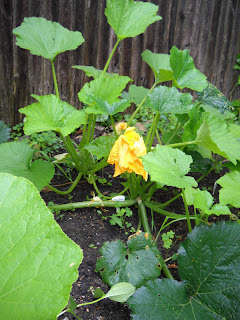 Giant Pumpkins — These too have big leaves and a few blossoms. Some vines are showing signs of the squash to come. This is my first year growing these, so I really hope I can harvest a few. blossom-to-be. Maybe it will be a 100-pound pumpkin some day! 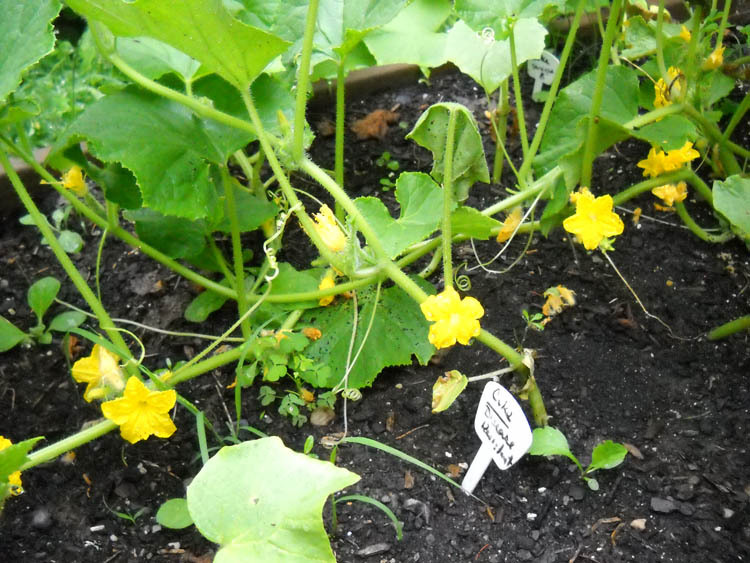 Cucumbers — Blossoms galore but no cukes yet. Are these late? Will they produce? It almost seems that there are too many blossoms. I love cucumbers, too; I hope they don't fail me! — I hope they are on their way. 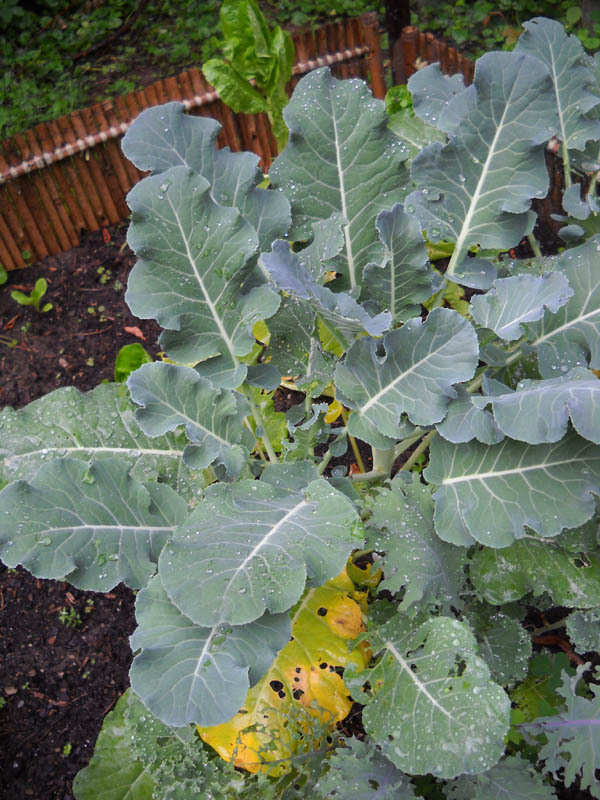 Broccoli — Produced great-looking leaves but no broccoli. I started some early in the spring under a cold frame and started a few more in early June. Both batches produced the same results. Is there something special that you need to do with broccoli? don't go on my plate — where's the broccoli?! Eggplant — I planted seeds in the ground, but nothing sprouted. Can you say Really Big Flop? Swiss Chard — They seem to be stunted. They just are not growing this year. Last year my crop was so good, I was eating Swiss chard from early summer until late fall. It was one of the last crops I harvested. I still have hopes for my stunted greens — my fingers are crossed. Being in my third real season of gardening, I thought I had passed the novice status, but I am now second-guessing myself. Things are just not coming along so well this year. Any advice on any of these plants would be a great help. Our garden is way behind this year, too. The plants didn't get hammered by the hail (we kept them inside long enough), but then have been really slow to catch on outside. You can send us your extra kale. We love it. Fortunately, we signed up with a CSA that has been getting us good produce (except for the week the hail wiped out). I'm glad to know I'm not the only one. Hopefully this heat wave will help my plants along. Are you also located in the Northeast? I'm not signed up with a CSA (I was hoping to have enough of my own produce this year), but I stock up each weekend at the farmer's market. Hi Kristy -looking good! I'm in the NYC area and there are a few things that are really taking their time. I have a couple of huge squash vines with no fruit yet! My hardneck garlic was so much bigger than the softneck - won't bother with softneck again. 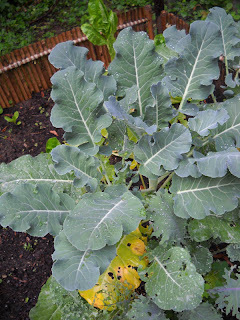 Bummer about the broccoli--we harvested some in september last year, so don't give up. I have similar problems here in central MA: tomatoes are still green, chard didn't come up, zucchini plant flowered but no fruit and my broccoli bolted in the heat. I am grateful for my CSA this year! Good luck. I think it's possible that the dwindling number of honey bees may be a problem in pollination that is needed to produce fruits on your squash, cukes, etc. Try pollinating them by hand using a paint brush. Once again, I am glad to know I am not the only one with these problems. But, I wish that none of us were experiencing them. Lorrie, I was thinking the same thing about the pollination. However, I do see bees and other pollinators working happily upon my plants. Maybe there just aren't enough of them? I've never attempted pollination myself. Is there anything I need to know before I go at it? Kristy...you know, it looks great to me. It just hasn't been a great year out east but... plants are just taking off here in Nova Scotia so I think you are on schedule with what's growing here. As for Kale...may I make a suggestion to put the raw leaves in your food processor. It will blitz them to fluffy confetti. Freeze that in bags (press the kale flat). Break off what you need all winter for your hearty soups. A good wholesome earthy flavor..and darn good for you as well. I even put some in my pasta sauce tonight. Peas were late..just starting now..beans..just making flowers...tomatoes..just starting to fruit red... All good! Think you are on schedule..just a late year. I really like the kale suggestions! After these hot days, I am hoping there has been some progress with my beans, cukes, and squash. Congratulations on your perfect tomatoes! I can't wait to see those turns into red. I've just harvested my garlic and it is relaly small in size. 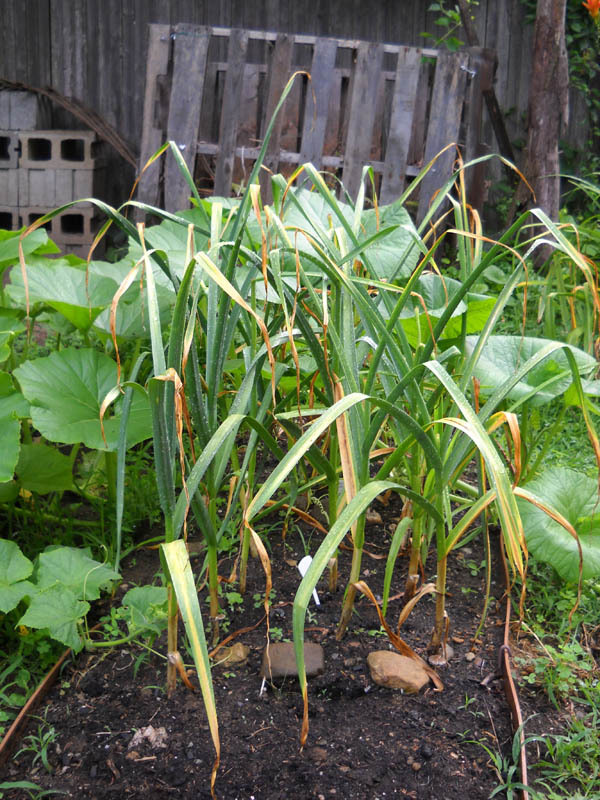 Is there a garlic that is really small or I just did something wrong on my gardening? What do you think? Kristy, I was thinking the same thing last night! Its our fourth year gardening, and I feel like it's our first all over again!! I guess we have to be patient. My broccoli didn't take either. I even planted extra bc we wanted to freeze some. Lovely garden! I also grow tomatoes, peppers and eggplants! They all have 2-3 ripe fruits and I'm so happy that I can see the workload paying off! Hi! I also see that the main reason why you are not getting fruits from your vegetables is the lack of pollinating insects. Just as what the lady suggested, you can do artificial pollination by brushing off the pollen from one flower and then transferring it to the anthers of either the same flower or to another flower. It’s just like that. Other factors that may contribute also to the problem are soil incompatibility, watering, sunlight, temperature, and availability of nutrients in the soil. I think any plant will only give fruits if it's on its best health condition. Hi, You are not alone my broccoli pants are huge but no sign of any broccoli yet the leaves are gorgeous it just doesn't make sense my tomatoes,cucumbers and peppers are doing very well in in NYC it has been very hot though i hear broccoli prefers cooler temps.